Win this app March 27th, 2016! Make some moves, create animation clips, and play with geometry. That’s right! You are doing math. 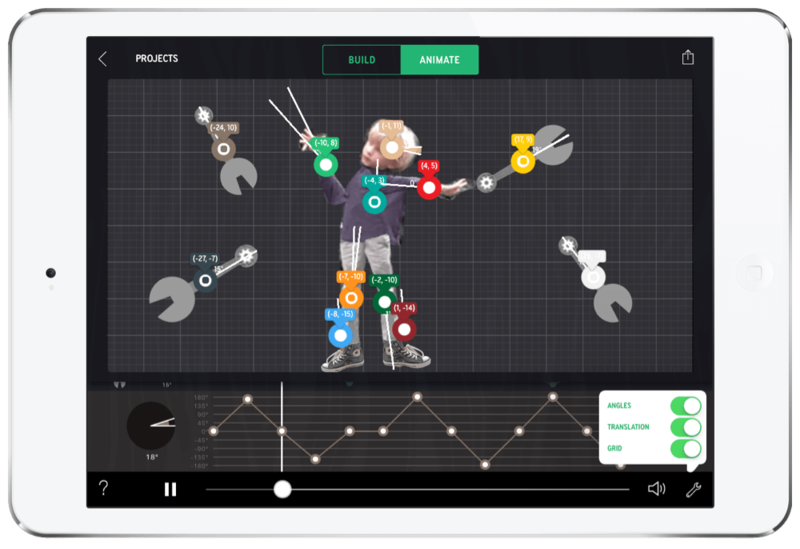 This clever app blends the art of animation with the introduction to angles, graphs, and critical thinking. Math is used in all things! Helping children understand how math is used in art, science, sports, play, cooking, and more can help them find the importance and joy in learning. This app was created by NYSCI. They have created a whole suite of innovative learning apps including Fraction Mash, Playground Physics, Size Wise, Volumize, and Choreo Graph. Let’s get started and make some animation! First take a picture. You want to find an object or person that can be used as the dancing character in your movie. In the tools tab at the bottom right corner of the screen, you can show a body tracing tool on the camera screen as you set up the picture. If you are using a person, this is very helpful and did make it easier. Right now with the current version, you can only use images that you take within the app. It was tricky to take a good quality image with my iPad and a very wiggly boy. Because of this, I am so excited for the new updates coming out soon. I got a sneak peak at what they will look like. They are awesome. You will be able to take an image in the app or grab images from your camera roll. You can use different backgrounds and the images will be a better quality because they won’t have to be taken just from the iPad. Once your picture is taken, it’s time to build the scene. You can drag your image into the workspace. You can also add props, other people, and music. Each item that you clip around an image, that clipped area will have its own movement. To make the person move on the screen, you will have to think through which body parts, and joints should be separated to get the dance moves you are looking for. I clipped around each arm, each leg, the head, and the body. It looked really cool but if you want to make it more realistic, clipping around the joints will enable even more movement. After your scene is ready to go, you will click on “Animate” at the top of the screen. In the Animate section, you will begin to time and choreograph your animation to fit within the :06 increment of time. You will notice all of the differen body parts listed in the segment. By clicking on the dots, you can move those body parts to different angles to help them jiggle, dance, walk, and move. Critical thinking will be required to make sure that the angles move at the right times in order to get the right moves. You can turn the angles, grids, and translation on to make it easier when moving things around. The settings are found in the bottom right corner with the wrench icon. It’s a great activity that blends art and mathematics together. Once you are finished, you can save the video to your camera roll. It did take a while for my video to save and the app froze once which was frustrating because I had to re-make the video. Be sure you have enough room in your camera roll and it will go faster. Some children with an Autism Spectrum diagnosis really struggle with fine motor skills like dragging and moving items on an iPad. Most will be able to drag the props and people into the screen but finding an easier option such as double clicking or an option to type in the angle degree would be helpful for those that struggle to drag and pinch. I have pretty small fingers and struggled myself getting the angle degrees how I wanted to them. If you are still confused on how to move and choreograph, don’t worry. help and support is close by. On the home screen, there is a tab in the upper right corner called “Intro to Choreograph”. This will give basic instructions on how to navigate the app and the best ways to use it. You can also click on the people section in the “Make Some Moves” page. They have a sample boy character that is already complete to look at as well. He can give inspiration for how to move your character. 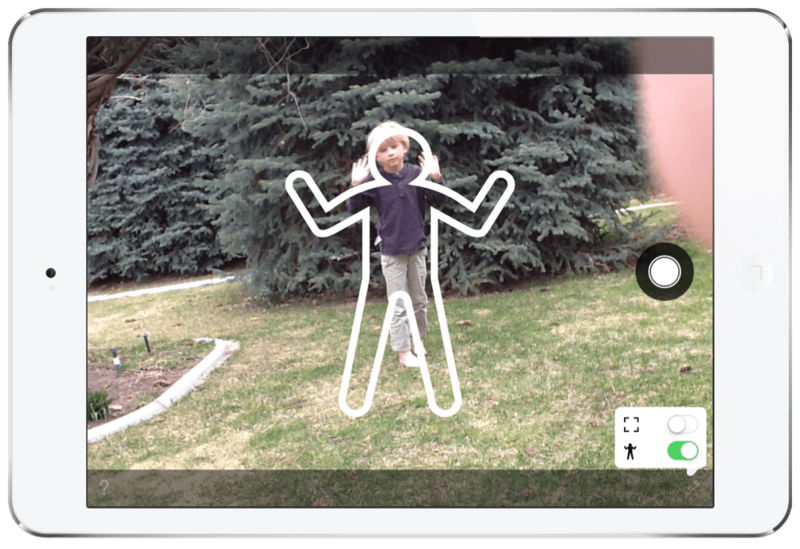 One excellent strategy for using this app would be to create several clips and scenes that could be combined into iMovie or a film making program to make a longer movie segment. The Tell the Story page lets you create reports, and outlines to show off what you have made. You can talk about what you have learned, show your teacher the video clip and how you get the right angles and timing, you can make a storyline for a future video you want to make. 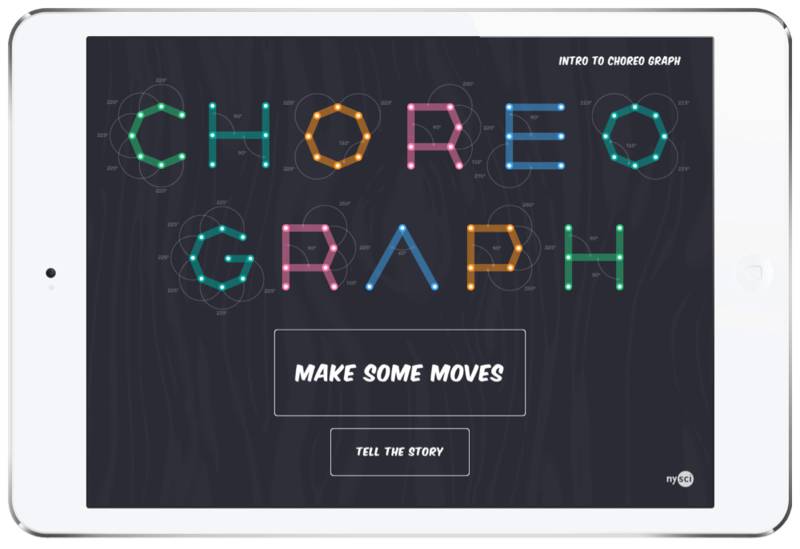 Choreo Graph is a simple but powerful animation tool that helps children create, use critical thinking, and understand how to better relate mathematics into creative processes. I would recommend this to children ages 8 and up but it is probably best suited for kids ages 11-14 years of age. Overall, I think this app is awesome. It will definitely interest many children with Autism Spectrum Disorders. They are often very visual and love the iPad. Many of them love numbers but struggle to relate it to art concepts. This is fantastic. It gives a child the opportunity to really dive into a subject and build upon that. I also think this app will be a great motivator to all students when learning about how math can relate to all subjects. I would recommend adding an option for those that struggle with fine motor skills to type in the angle degree they are looking for and in addition to the pinch and expand benefit, offer the “+” and “-” symbols as well for sizing body parts and images to the animation scene. Further, I would love a sharing option on the Choreo Graph website where you can gain inspiration from others’ work and show off your own. 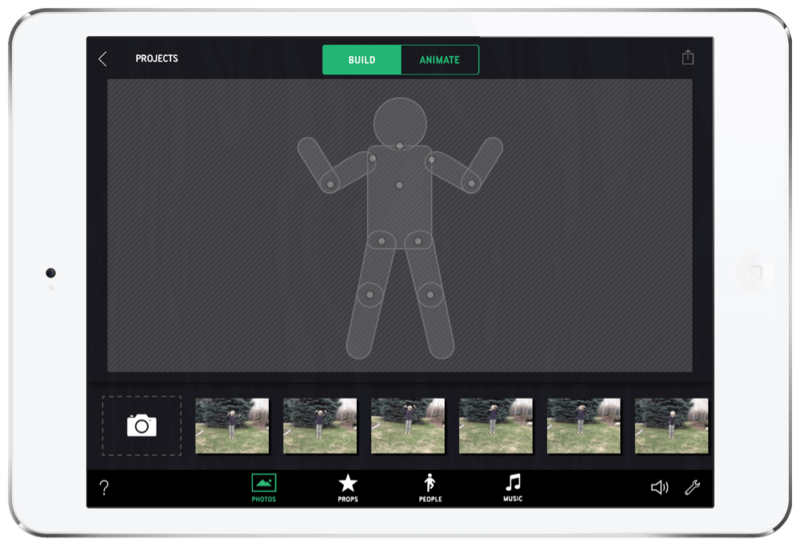 Be sure to check out the Choreo Graph app, and enter the giveaway on the Touch Autism Facebook page. To learn more, check out the Choreo Graph website. inspiring the use of math in all things, including animation. Download Choreo Graph in the App Store today!